Are you going to repost the beta Fuji with the solar panels? Ermm... It is not Blok-D, it is Blok-A. B-V-G-D-Bloks are radial attachment boosters. I'm sorry! I had that weird brainfart that the core was inserted between the radials, ofcourse the radials were built around the core. Rep added. And thanks for the videos/songs! So, now about music. Military music? I really don't think it is correctly. There are tonns of space soviet songs! This song is from the soviet film - Planet of Storms (ÃÅ¸ÃÂ»ÃÂ°ÃÂ½ÃÂµÃ‘â€šÃÂ° ÃÂ±Ã‘Æ’Ã‘â‚¬Ã‘Å’). DINOSAURS ON THE SURFACE OF VENUS!!! I think he ought to wait for .90 to roll out to release his newer stuff. Plus, he'll be able to resolve any unlikely conflicts Tantares has with .90. Should we expect just Fuji in the next release, or are you waiting to get finished with Energia as well to update the releases? Also, will Energia be sized appropriately to support a Buran made of the new .90 MkIII Spaceplane parts? Great work, as always. A lot of cool music coming out the woodwork, thankyou, and SnowWhite and Dimovski also! The launcher image, the last three rows are pure gold. Great inspiration. Yeah for sure, "actual" release of Fuji will wait 0.90. The separation means I may get around to the N-1 at some point, some day. But, we will see more later. As promised, here it is. So consider this a "pretty much complete" iteration of the Fuji / Polaris. Aside from one more minor part. What I'm interested in feedback. Mass of the part, correct and balanced? A vague benchmark for the Fuji was the ability to make lunar orbit and return. This should be able to do that (In the Kerbal sized system). But, I am not the best pilot. Beale, can you make an alternative version of FUJI (may be with modular OM) with 1.25m docking port placeholders? I just strapped the Polaris onto my standard LKO rocket and tried to reach Mun orbit. Didn't quite make it and had tu use RCS. Guess I have a Munar orbital laboratory now. The torque seemed fine, could even be lowered a bit imo. I'm not really good with balancing either so I don't know about the other stuff. The Mun orbit and return should be possible I think, my testflight wasn't quite perfect. I am not quite sure what you mean? Do you mean a double size Fuji? I just strapped the Polaris onto my standard LKO rocket and tried to reach Mun orbit. Didn't quite make it and had tu use RCS. Gues I have a Munar orbital laboratory now. Thanks for the feedback, great, it will be helpful. I do think the trans-munar capabilities don't leave much in the way of margin of error. Erm, I'll take a look. I think a drop of more fuel will make it more capable (Plus the tank doesn't hold that much currently, considering it's fairly large size). I would love to see more burgundy parts. Would you like the original .PSD texture? No! I think, it now bigger than needed! Hm, Beale, how do you think about bigger (something about 0.8m - 1m) docking port for TANTARES pack? Can you make it? Beh... I'm not so sure. It would not then just be a flatter Mk1-2 pod? But, it was only compatible to dock with smaller ports (0.625m). I think a general 1.25m docking port could be good. But I will wait to make a craft that requires such a part. I found the original Fuji, hiding in my file system. It has come a long way since then. Sure. I'm always curious about other peoples textures. I was thinking, maybe to give Polaris a bit of science functionality to utilize that "roomy" OM. Maybe you could fit some material science bays or some mystery goo containers in there? It would be cool if the Kervant module was a mobile processing lab, as well. The optimum placement of RCS thrusters is so that the RCS thrusters, as a single object, act through the center of mass. 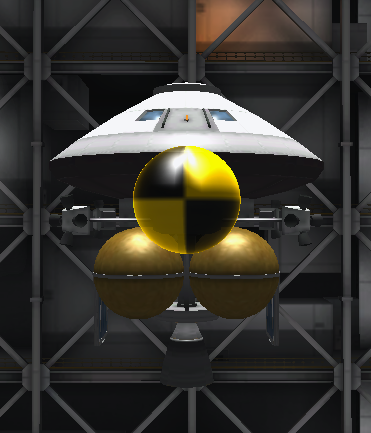 When there is an offset, problems can occur when using the thrusters, especially during docking maneuvers, since the incorrectly-placed thrusters can make the spacecraft rotate in addition to translating. The solution to this would be eliminating the offset, either by adding linear thrusters on the lower half of the OM, or changing the mass distribution among the parts so that the offset is reduced or eliminated. You're storming ahead with this RO stuff! Hmm, I think there is a danger of it being un-balanced. Given it is already much lighter than a stock crew tube, science functionality on top of that would be even more. On the Kervant, I do agree. In fact, it should already, but it was cut out because of an annoying bug. For the "Full configuration" I think yeah it is required there for RCS on the OM. The small offset on the basic configuration, I think is manageable, with the torque the capsule provides. 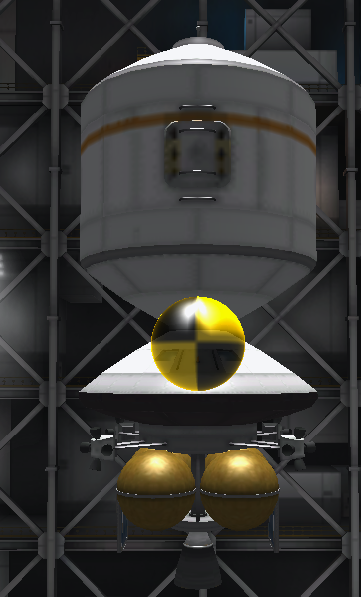 Given I am adding more fuel to fuel tank, it should be dead on the centre of mass afterwards. Your storming ahead with this RO stuff! 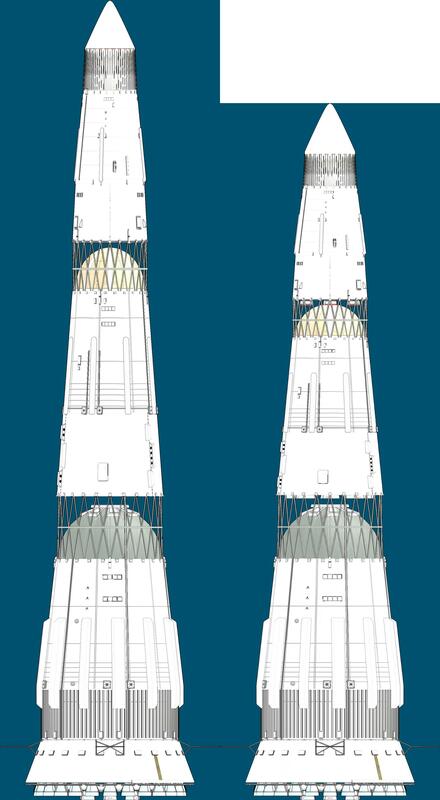 About those verniers: there is a lot of mystery I've found about Vostock/Luna and its upper stages (and some satellites in late 60s), but basically Russian wiki tells us that the vernier thrusters on Block "E" existed and were fed by main thruster exhausts. Well it seems there will be room for a bit of artistic licence on the 0109! It's not a problem. In most cases we already have several "copies" of some pods. It's not bigger docking port, it's just standard small port with conic adapter. HA! I think, if you make the 1m (that size better for your mod) port, Niemand303 or someone else build proper craft (ISS-like station already posted). If you split OM into two seperate models - cylinder and cone, I will love you even bigger. Interestingly enough, they fly really well in RSS. Only used up something like 40 units of monoprop during ascent. BTW, I was searching info about the Proton fairings and found out they cost approximately 30 million dollars, so if someone would want to buy them you're welcome. Well, as I haven't found any good possibilities to remove mass from fairings, Salyut will be slightly lighter than IRL, otherwise it won't make it to orbit. I've also found an awful lot of mistakes in Proton and I'll gradually introduce fixes, so, in a three or four hours I'll present the new version, with blackjack Salyut and Vostok. Although, some help with solar panels would be welcome. What the literal ....? Who had the idea to make that!? Hah! I love it. who ever has drawn this, they have some talent. I think so, another bit of paper taped to the wall. What mod is this N1 from, Bobcat? I do rather like it. Ah, I wish I could help. But, I'm sure it will be great any way!